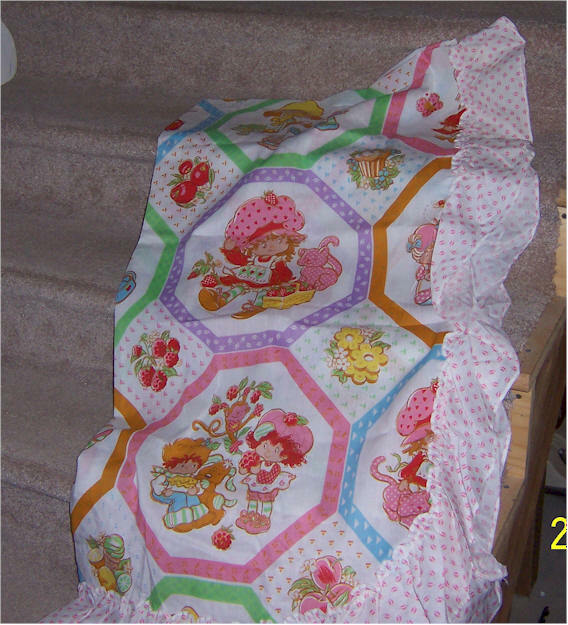 Strawberry Shortcake Sleeping Bag. Clean. Very Good condition. Strawberry Shortcake blanket. Very clean. 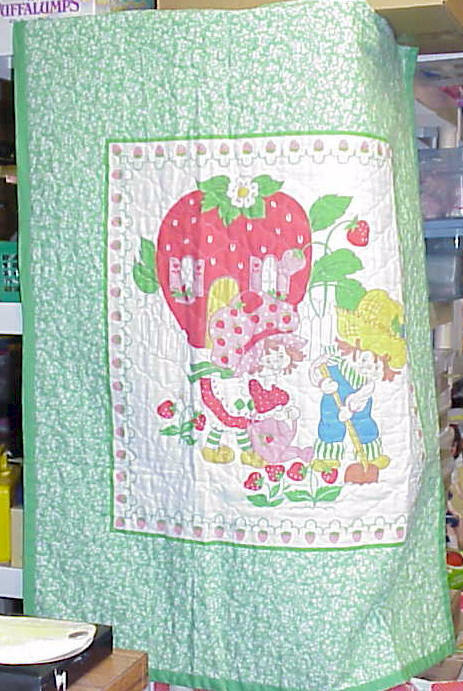 Strawberry Shortcake cotton curtain w ruffled trim. One panel. Brand new condition. Never used. 46" x 77". Could use as a spread. Super nice. Great colors. 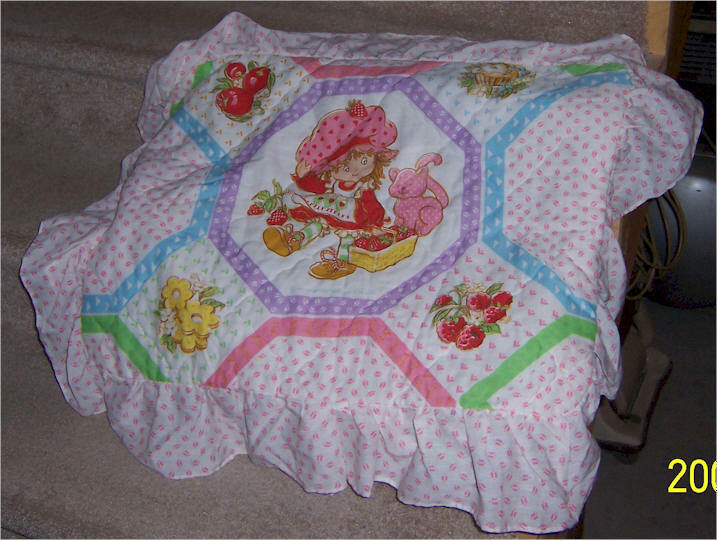 Strawberry Shortcake Pillow Sham w ruffles. Good condition. 19" x 62". 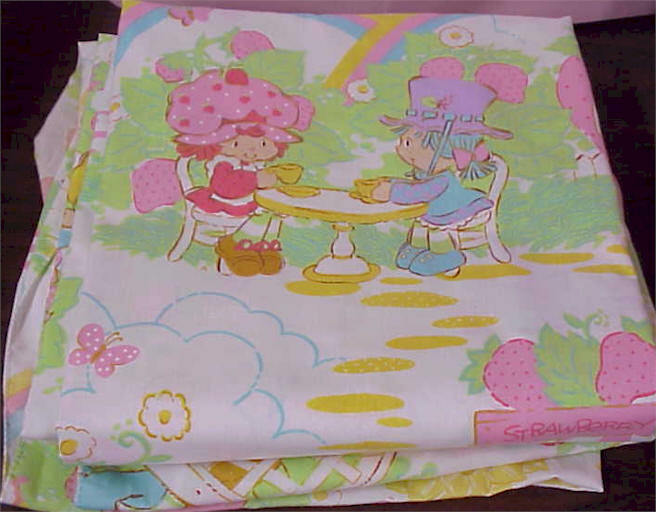 Strawberry Shortcake curtains. Valance 11" x 58" . Curtain measures 33" x 36.5". Total 66" x 73. Excellent condition. 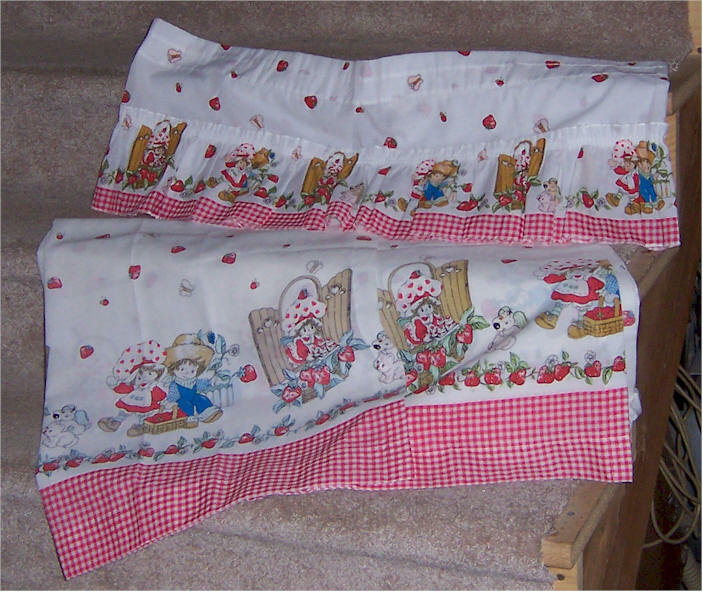 Strawberry Shortcake Valance by Montgomery Ward. Good condition. Very bright colors. Each panel 84" x 11". Total width 168". 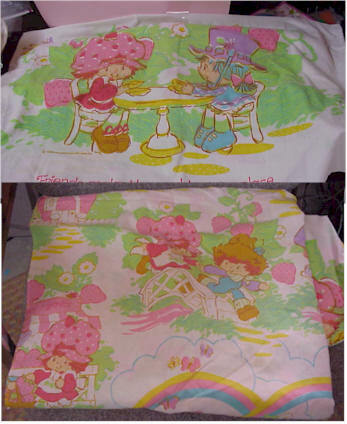 Strawberry Shortcake Valance by Montgomery Ward. Good condition. Very bright colors. Each panel 41" x 11". Total width 82". 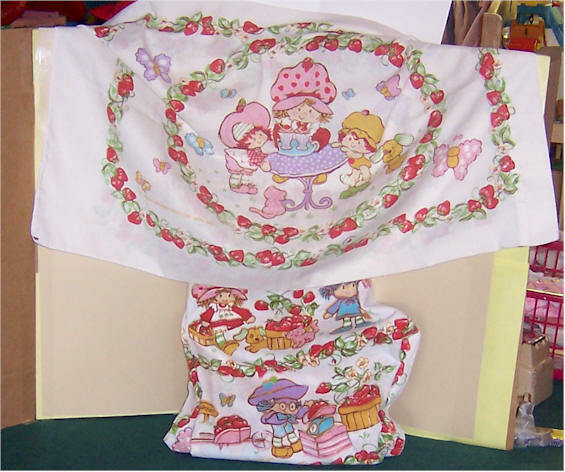 Cotton Strawberryland flat sheet, fitted sheet and pillow case. American Greetings. 1981. Clean. Cotton Strawberryland fitted sheet with pillow case. American Greetings. 1981. Excellent Condition. Very clean. Bright colors. Cotton Strawberryland flat and fitted sheet. American Greetings. 1982. Good Condition. Clean. 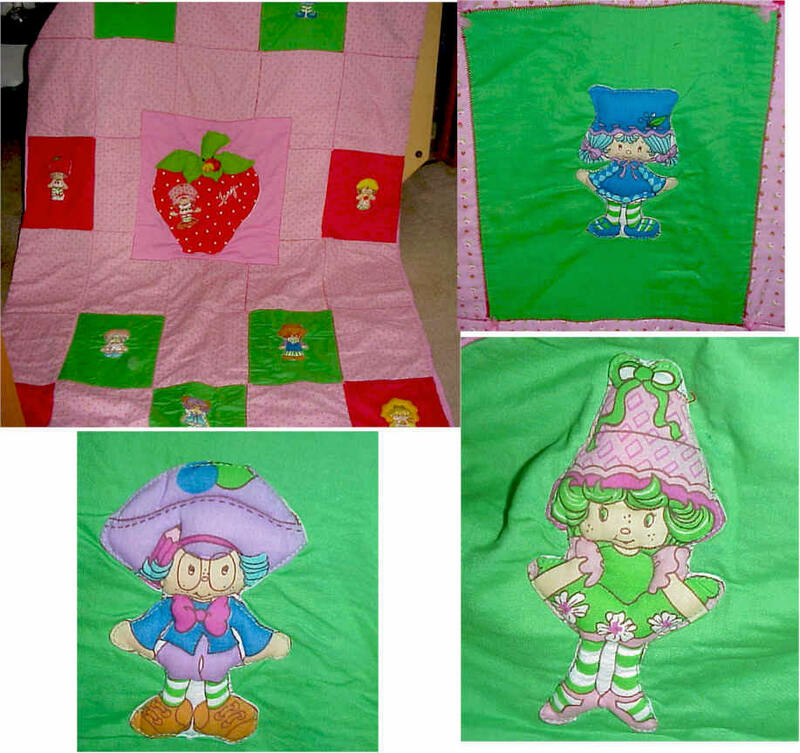 Home made Strawberry Shortcake quilt. Excellent condition. Fits twin bed. 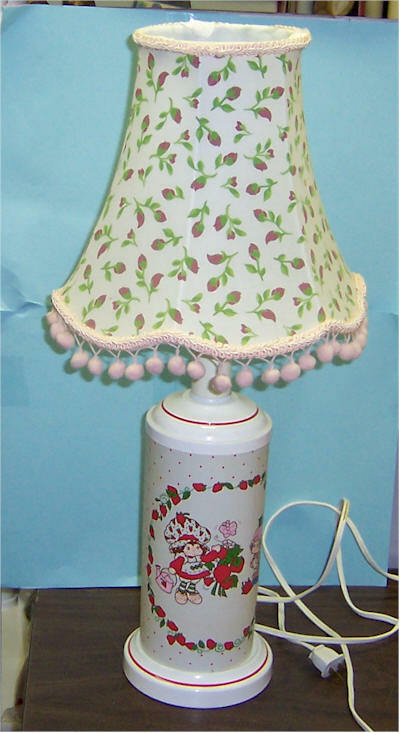 Table Lamp with night light base. On/Off switch. Lamp shade is included, but not SS.